I’ve been writing this thing in my head for weeks. That quote…it crystallized the way I want to feel about the first half of this year. And the way I’m coming around to feeling about it. Hearing it on one of my go-to sport podcasts – Jon Marcus and Steve Magness’s excellent On Coaching – was the impetus I needed to get it on a page. There was an unhealthy dose of struggling and a fair amount of failing in the first six months of 2018. Our toddler Edward was in daycare, our infant Malcolm was with us at home. Both Diana and I have essentially full-time jobs that we primarily do from home. Trying to manage our respective businesses while taking care of an increasingly-busy and curious little boy, while giving enough love and attention to his older brother, taking our pup Rupert for his daily walks became untenable. We couldn’t do it. We constantly fought over the privilege of having the time to work. Home became a place I did not really want to be. On top of that, the X3 Lab was in financial trouble. The overhead of operating a brick and mortar space in Toronto is high, and we just could not fill enough of the seats. Ridership declined from the 2016-17 season to the 2017-18 season. Much of the reason for this was the wide acceptance of platforms like Zwift and Trainer Road. These subscription services improved the at-home bike trainer experience, filling some of the role that only studios had met in the past. The price of smart trainers too had come down substantially. Gone were the days when Computrainer was the only game in town, and the price of their trainers was in the $2,000+ bracket. In 2017, a fully-functional, entry-level, smart trainer could be had new for $900. The ecosystem and the calculus for indoor bike training had changed. I couldn’t afford to keep bankrolling the Lab, declining revenue and all. I had to make the call to shut it down. Once I had made the decision, I never second guessed it. It was the right big-picture call. Understanding that, however, did little to blunt the emotional toll it took. With the battleground that was home and the loss of my studio, I struggled to be present in my role as a coach. I had to have the answers for the athletes who trusted me to guide them. It was tough to always have those answers for others when I often had none of my own. I am ashamed to say that there were times when I did not deliver the quality of service that I was once proud to associate with the X3 brand. I wasn’t there emotionally. I knew it too. That made it harder still. I began to second-guess my ability to be an effective coach. I started looking at job boards. I told myself that I was keeping my options open. Then things changed – as things have a tendency of doing. Malcolm started daycare. I no longer had the crushing financial burden of paying commercial rent and overhead each month. So Diana and I stopped fighting over work time and over finances too. I had encouraging and supportive conversations with a few folks who knew what was happening. I doubled down on the coaching, working on elements of my offerings that were weak. I sought help. I dove back into the physiology research. I started speaking with smart people working on cool things. It became fun again. X3 is changing. I am reducing my max number of coached athletes by a third. I am reinforcing existing partnerships while looking for new ones. I am working on producing more written content. Towards the end of that podcast episode, Marcus talks about being the coach he is today because of all the failing that he has done in his past. He also spoke about the importance of having permission to fail. I get that now. I mean, I understood it intellectually for a good long time, but now I truly believe it too. I may have failed on a number of fronts, but I am not going to quit. Can one be inspired by something that was inspired by something and someone inspirational? That just happened. Thank you for sharing, and I look forward to hearing more! Thank you for the kind words Sharlene. Thanks neighbour! Let’s chat soon. Coach! You always continue to inspire and bring me back from lack of focus. Amazing coach, quality of feedback, attention to detail, and honesty. Looking forward to the future! Thanks man. You’ve got big plans this season. I’m excited to be a part of em. You don’t know until you know….. I have learned so much from my mistakes in business & learn everyday! & FYI having a young family only teaches you more & more along the way 🙃! Sharing your thoughts helps other… thank you. 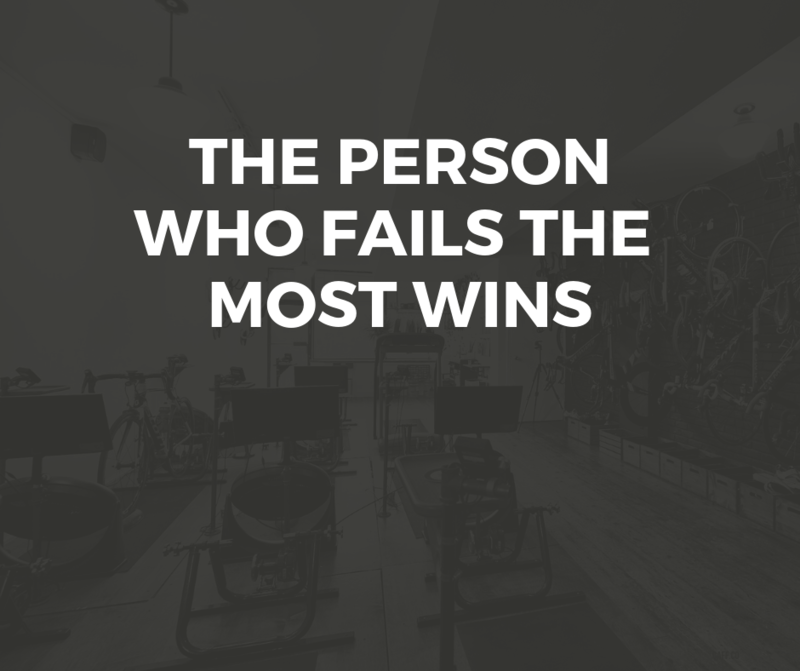 I am a firm believer that failure is one of the best teachers. I’ve had my share, just like everyone else, including some of the most successful people in the world today, and ever. I am still failing in the pool, but haven’t given up yet. Onward. Thank you Ann. See you on the bike! Respect is earned not given. You always had mine Coach Michael. Thanks for sharing and inspiring. See soon. Thank you Andy. It’s a journey for us all 🙂 Looking forward to riding with you this coming year. just reading your post now….yup a struggle that feels like your in an emotional washing machine usually gets us to a new level of personal growth but the journey can be a challenge. You have built up a terrific brand with your athletes and you are ready for the next adventure. Thank you for your support and coaching. Thanks Debra. Change really is the one constant. It’s been a pleasure!